Jason Gillespie, with 15 years’ experience in upscale custom home building, has been working with Phil Gillespie since the early 90’s. He was working with Phil and wiring homes in the Cliffs communities, as well as Montebello and much more. Even during slower economic times, Center Pointe Properties was in high demand, because of the company’s reputation for quality and excellent customer relationships. In 2016, Jason and Phil Gillespie teamed up together with Center Pointe Properties. Phil had 37 years’ experience in upscale custom home building, and had run his own company, Center Pointe Properties, since 1996. Center Pointe was known for its dedication to craftsmanship and commitment to customer happiness, so the partnership was a perfect match. Center Pointe Properties designs custom homes from the ground up. 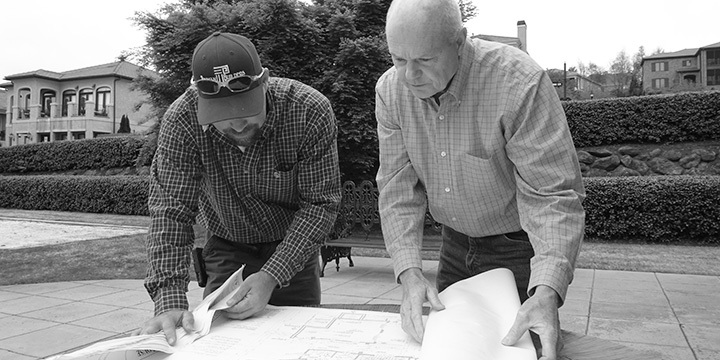 We help customers find existing plans and adjust them to meet their needs, and we also work with local architects to design completely-custom homes. We’ve built plans from top architectural firms, such as Living Concepts, Euro World Design, Frank Betz Associates, Don Gardner, Garrell Associates, and Stephen Fuller. Why do our customers choose Center Pointe Properties? Here are a few reasons. Our homes are built with the newest innovations, highest quality, attention to detail, and are finished to last a lifetime. We know our home owners expect and deserve the best, and we take the extra time choosing the best premium selection products, from wood to appliances. We take pride in being on-the-jobsite home builders. We oversee the project step by step and are involved in each detail. All new homes are custom built from the ground up using only the best team of sub-contractors in our area. We stick to our customers’ budget needs while at the same time ensuring exceptional quality. We’re members of Home Builders Association in Greenville, SC.